Social mix, what does it mean? “Social Mix” refers to the diversity of levels of income, tenure and social class in a given neighbourhood. For a vast array of reasons, the term is often used in public policies to refer to the introduction of more middle class households/homeowners/private tenants in an area with a high proportion of social housing dwellings. “Social Mix”, or “integrated communities” are part of the current housing policy of NSW Government for urban renewal areas, as described in “Future Directions for Social Housing in NSW” policy document. Is Waterloo already a mixed community? Why does the government want to change it? Does academic and scientific literature supports the supposed benefits of “socially mixed” communities produced as results of urban renewal? These resources should help you make up your own mind. What is the best way to create social mix? Social mix is a concept and a public policy that encompasses many ideas and concepts. Due to its complex and difficult to define nature, there is debate about what is true ‘social mix’ and how it should be implemented through planning and urban design. 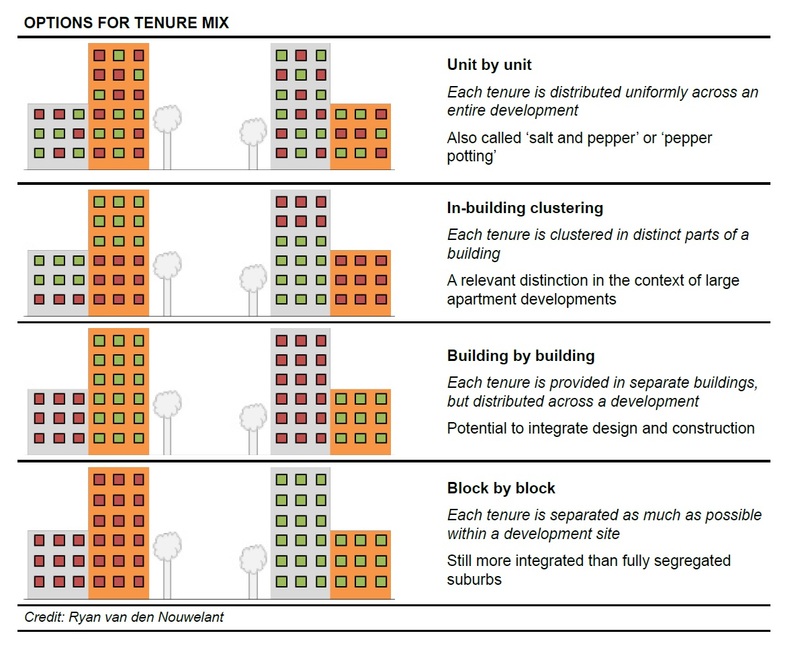 You can find below a typology of the different ways to create social mix in a neighbourhood. Each of them has its advantages and challenges. This typology was created by academics who research social mix, study its effects, and report on whether it delivers promised theoretical benefits. For a more in depth discussion of these different ways of creating social mix and their impact on successful outcomes, along with discussion of benefits and disadvantages, have a look at this report prepared by City Futures UNSW. As part of the Waterloo Community Capacity Building project, we will organise a discussion in March around the best ways to create socially mixed communities, and what do current residents think are the ‘conditions’ for a successful and truly mixed community to be created in Waterloo.